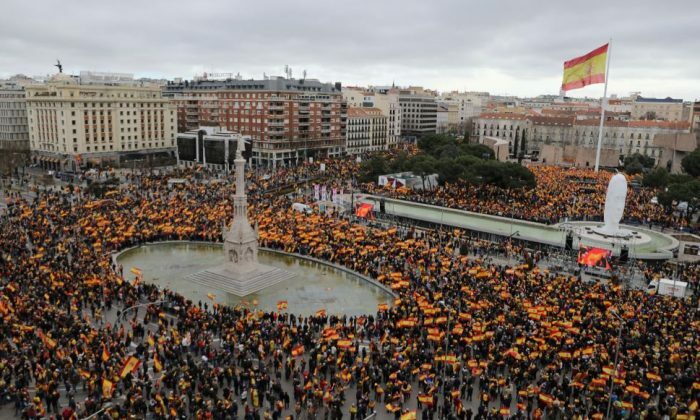 MADRID—Tens of thousands of people waving Spain’s red-and-yellow flag demonstrated in Madrid on Feb. 10 to oppose any concessions by the government to Catalan pro-independence parties and to call for early elections. The opposition center-right and right-wing parties called the rally, seeking to make a show of force against Sanchez by capitalizing on anger with Catalonia’s separatist leaders and the government’s efforts to establish a dialogue with them. The government’s proposal on Feb. 5 to appoint a rapporteur in talks among political parties to address the Catalan independence crisis galvanized the opposition, which has deemed it a betrayal and a surrender to pressure from Catalan separatists. The government is squeezed on both sides of the Catalan issue: Deputy Prime Minister Carmen Calvo said on Feb. 8 the talks were on track to fail because Catalan pro-independence groups had rejected the government’s proposed framework. The Catalan groups want a referendum on independence included on the agenda, which Madrid will not accept. The government faces a key vote on Feb. 13 on its 2019 budget proposal. Failure by parliament to approve the budget bill could prompt a snap election before the next scheduled vote in 2020. When Virginia Ruíz jumped into the ring to comfort a dying a bull, she stunned her native Spain.